Credit: Instituto de Astrofísica de Canarias. In a new study, researchers have discovered lithium in a primitive star in our galaxy. The star is J0023+0307, which was discovered a year ago. The finding may provide very important information about the creation of atomic nuclei in the Big Bang. The research was conducted by scientists at the Instituto de Astrofísica de Canarias (IAC) and the University of Cambridge. In astrophysics, any element heavier than hydrogen and helium is termed “metal” and lithium is among the lightest of these metals. Lithium was synthesized in the Big Bang and is a very fragile metal. It can be easily destroyed in the interiors of stars by nuclear reactions. In this study, the team found the star is similar to our sun, but with much poorer metal content. It is less than one-thousandth part of that of the solar metallicity. The lithium content of this primitive star is similar to that of other metal-poor stars in the halo of our galaxy. 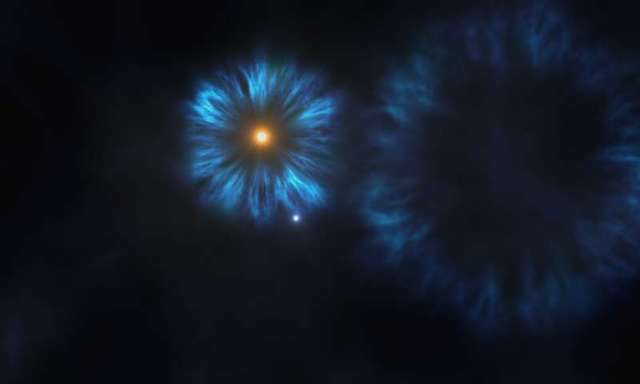 The team suggests that the star may be formed in the first 300 million years of the universe, just after the supernovae marking the final phases of the first massive stars in our galaxy. The atmosphere of this metal-poor star does not reach a very high temperature, and the lithium remains in it for practically the whole of its life. The researchers suggest that this star retains this constant lithium content, and it has a very low metallicity. The lithium might have been formed in an even earlier phase in the evolution of the universe. The primitive star was found by with the Gran Telescopio Canarias (GTC) and the William Herschel Telescope (WHT) of the Observatorio del Roque de los Muchachos. The researchers suggest that the star may provide information about primordial lithium formed in the Big Bang. The lead author of the study is David Aguado, a researcher associated with the University of Cambridge and formerly a doctoral student of the IAC/ULL.